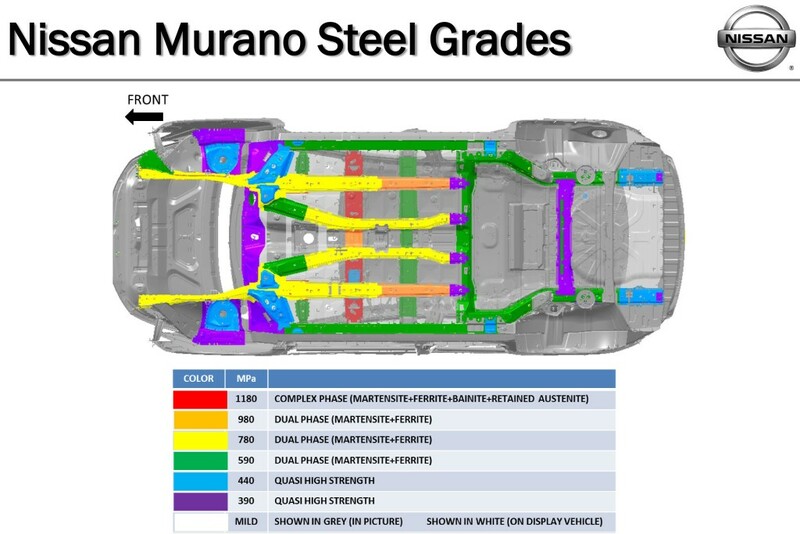 The 2015 Nissan Murano added features and increased in size, leading the automaker to take an exhaustive look at lightweighting the latest generation of the crossover, an executive said last month. 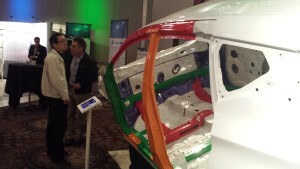 “We had a big challenge here to reduce the mass” without sacrificing safety, David Coakley of Nissan told the Great Designs in Steel conference in May. “Every little bit counted,” Coakley said, noting that lightweighting “was a big part” of the 2015 redesign. The crossover weighs as much as 145 pounds less for 20 percent better gas mileage, according to Nissan, and Coakley’s presentation suggested that even more weight could be cut. 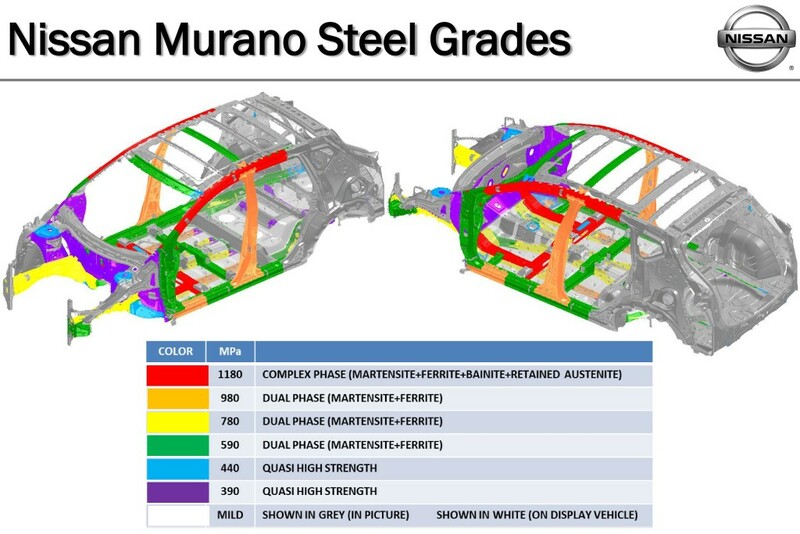 A rendering presented at the conference depicted the Murano with high-strength 590-megapascal and 780 MPa ultra-high-strength steel replaced with even tougher 1,180 MPa bones. Coakley said later during the question-and-answer period that for Nissan, the challenge of welding the 1,180 MPa steel versus lesser grades could be overcome “relatively easily” for an OEM, meaning that repairers could see a lot more of the material in the future. “Mild steel still has its use,” Coakley said. 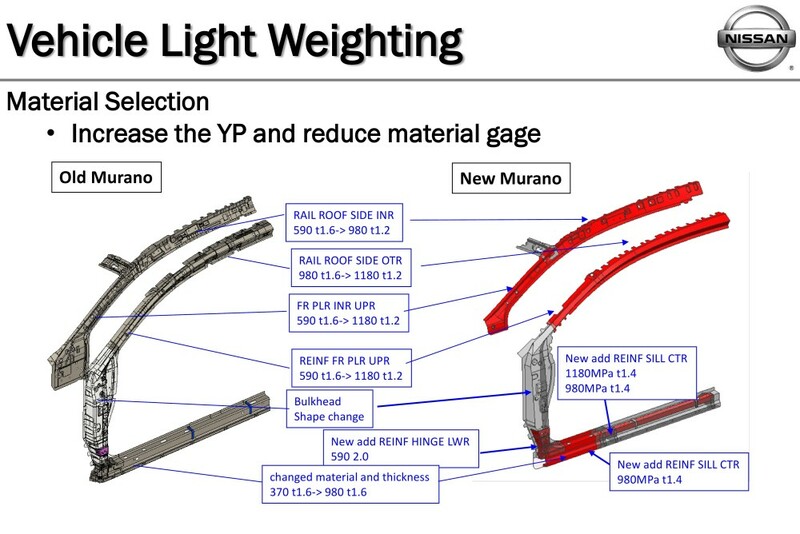 A look at the roof ring points out both the increased strength and decreased weight of the new Murano. 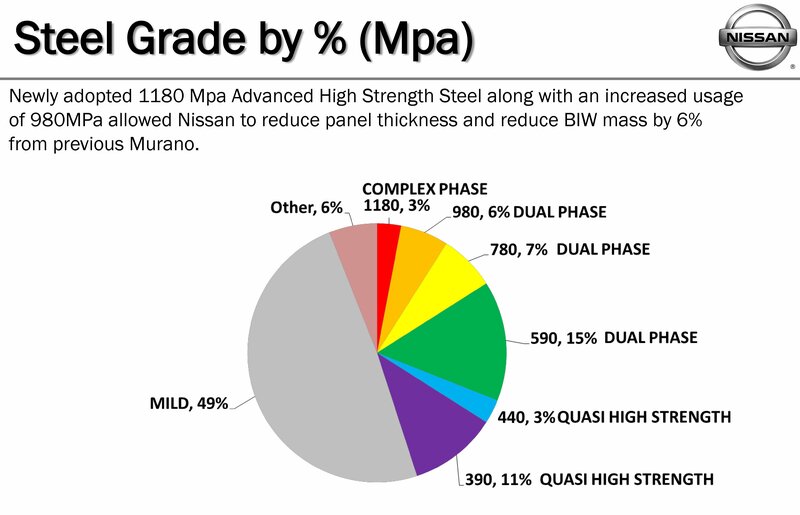 High-strength 590 MPa steel, for example, were swapped out with thinner 1,180 MPa steel with double the yield point. These changes led the Murano to claim the Insurance Institute for Highway Safety’s Top Safety Pick-Plus award. Coakley also displayed intricate animations detailing how each part behaves in crashes like the IIHS’, similar to this pro-OEM-parts Nissan video which describes the hood’s role in a collision. This type of detail on simulations could lead to a greater consideration for automakers of how “cosmetic” parts behave in a crash, which could be trouble for aftermarket manufacturers. 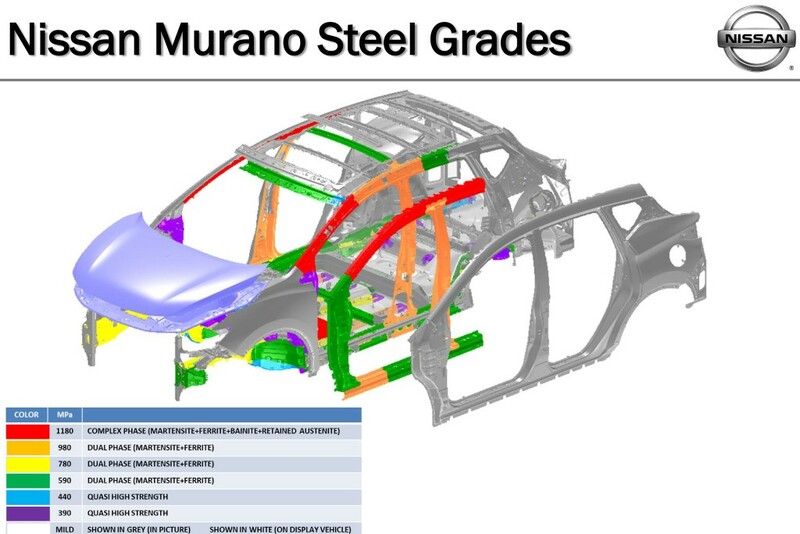 However, Coakley said Nissan’s primary concern for its outer panels on the Murano was stiffness for dent prevention, not energy transfer for crash safety.